Unlined Chimneys – A typical unlined chimney is a brick pillar, i.e. four brick walls. Unlined chimneys allow heat to move through brick chimney walls very quickly. During performance testing of chimneys, unlined chimneys performed so poorly that testing was abandoned. 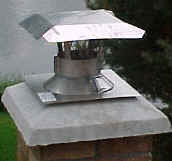 If the chimney flue is unlined, the liner can not perform its intended function. 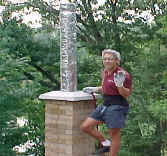 Since the early 1980s, fire code has stated that masonry chimneys shall be lined. Clay Tile Lined Chimneys – The most common material used as a lining for masonry chimneys in new construction is terra-cotta clay flue tile. It is a relatively inexpensive and easily obtainable product. During performance testing of chimneys, clay flue tiles were easily damaged during the testing of thermal shock. All of the flue tile samples subjected to the heat shock test suffered damage in the form of cracking. Testing has also shown that clay tile does not crack from normal usage. Thermal Shock and Liner Damage – Clay tile is a ceramic product and as such it cannot rapidly absorb and evenly distribute heat during rapid temperature rises in the chimney. A rapid temperature rise (as during a chimney fire) will cause the clay material to rise in temperature much more rapidly on the inside than on the outside of the tile. As the inside heats up, it will begin to expand very rapidly, much more rapidly than the cooler outside is expanding. This uneven heating produces an unequal expansion which in turn causes the flue tiles to crack and split apart. This is similar to immersing a cold drinking glass in very hot water. It will shatter instantly. Thermal shock results only during periods of rapid temperature rise or fall. These conditions are met almost solely during what is known as a chimney fire, or when water is introduced during a fire, rapidly cooling the tile. According to fire codes, if the flue liner in a chimney has cracked so that it no longer has the continued ability to contain the products of combustion ( i.e., heat, moisture, creosote and flue gases), it shall be removed and replaced, repaired, or relined with a listed liner system. 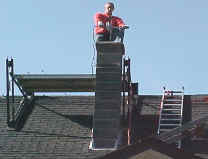 If the chimney has cracked flue tiles, the liner can not perform its intended function. Having a fire in the appliance, will heat up the flue tile and the cracks in the flue tile will expand creating gaps. The products of combustion can now go between the flue tile and the chimney structure where they can not be swept out. This may lead to the deterioration of the chimney structure. Cracked flue tile also become susceptible to falling out creating a blockage in the system. Removing flue tile by banging them into little pieces. Removing the pieces of flue tile from bottom of chimney. UL listed rigid stainless steel chimney liner wrapped with ceramic wool insulation wrapped in stainless mesh to help hold insulation on over time. .
Top tee opening to transition to stove pipe bottom opening for cleanout. Stove pipe installed on top. Tee cap over cleanout access on bottom. Completed. Mortared up chimney. The lower cap is the cleanout. Alternate liner attachment to fireplace insert.